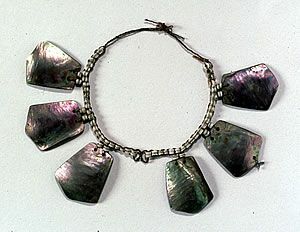 Abalone shell necklace, Costanoan, 1806. This is one of several ceremonial items collected and illustrated by Georg von Langsdorff while visiting San Francisco on Russia's first voyage to California. Abalone pendants, clam disc beads, and fiber. Staatliches Museum für Völkerkunde, Munich.